I refuse to use herbicides for weed control, and here is why. Tree frog in my plastic greenhouse. As a master gardener trainee, and as a student of horticulture at a local community college, I was consistently presented with the idea of Integrated Pest Management. The IPM approach does not eschew the use of pesticides and herbicides, but it encourages alternative approaches to their use. This implicitly acknowledges the dangers of improper use or overuse, and reading between the lines, may be some acknowledgement of the dangers of even proper use. I admit to using pesticides in the case of treating buildings for termites and carpenter ants. But then, with proper maintenance, this would not be so much of an issue. In the garden, I may use Deadline for slugs although I am considering quitting this habit as well. I’ve never felt the need to use herbicides because in my previous small urban garden plots, I never needed them. Now, I face a weed control issue of magnanimous proportions. I’ve got everything here: reed canary grass, English ivy, scotch broom, and various grasses and weeds that invade my new beds and exponentially increase my maintenance work. 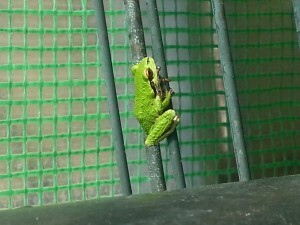 My place is also a home for hundreds if not thousands of tree frogs. These tiny amphibians start out life in lake and surrounding wetlands, but during the summer, the explore the upland areas as well, and can be found hundreds of feet from water on the warmest days. Mowing and weed-whacking become a challenge as I attempt to dodge the little green hoppers that fly out of the grass before me. Herbicides are often used in the PNW for reed canary grass control. This invasive grass is generally found in moist areas and can destroy entire wetlands by distributing its creeping rhizomes to form a nearly impermeable mat. I’ve seen the damage myself, and seen small water courses otherwise useful for fish completely filled by this introduced grass. Yet several studies have found that at least one common herbicide has the potential to kill tadpoles on contact and may affect other elements of aquatic ecosystems, including oxygen levels and even predator-prey interactions. I would vote for patience over parsimony in most any case for which herbicide offers a quick solution. I mow and pull the reed canary grass on my land, and have considered deploying black plastic to kill back other populations long enough to use interplanting to shade it out. Agencies with short fiscal timelines will often advocate broad-use applications of herbicides to get more immediate results. Many will argue the long-term effects are minimal. Yet I would argue that there is plenty we don’t know about the comprehensive impacts of the chemicals that we use. Studies of biodiversity and chemical controls suggest that we may be altering our ecosystems in ways we don’t completely understand (e.g. http://www.moraybeedinosaurs.co.uk/neonicotinoid/Pesticides_and_the_loss_of_biodiversity.pdf). Instead, we are left wondering why our frog populations are disappearing. One species may not have an effect noticeable to us, but that is because we usually aren’t looking. 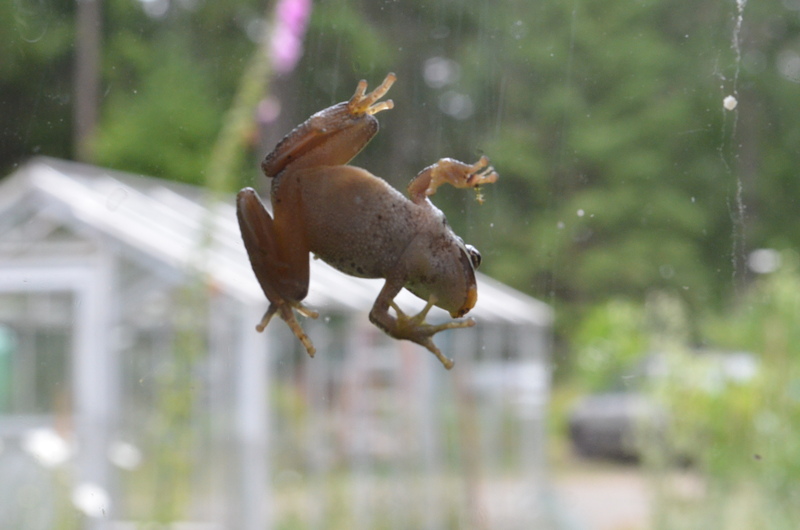 The Pacific tree frog is, in my years of observations, the most common frog out here. In fact, I don’t see any other frog species on the island and usually only tree frogs elsewhere around the Puget Sound. What will fill its place? Casual use of herbicides by homeowners, or even as a primary tool for habitat restoration, may not be worth the cost. The stakes aren’t high enough if the goal is to save time and reduce labor. I’d rather keep the frogs.